A TV adaptation of the popular series hopes to portray its action and humor. Let's see if you can name this TV show: four unconventional ex-soldiers find themselves on the wrong side of the government, and must now evade capture while helping people and trading funny quips along the way. If you guessed The A-Team, you're right, but apparently, there's enough room for at least two military action-comedies in this world. 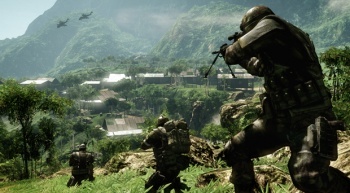 Battlefield: Bad Company, EA's humorous shooter spinoff, is getting the small screen treatment courtesy of Fox as an upcoming TV series. The show will come courtesy of John Eisendrath (producer and writer on Alias), Sony TV, and Happy Madison (a studio that specializes in comedies). Each episode will be an hour long (or, more accurately, 42-44 minutes once you take commercials into account), and follow the story of the game's four protagonists as they evade their former commander, now an agent of a shady government faction. There's no word on how closely the show will follow its source material, but both Patrick Bach and Patrick O'Brien, high-ranking representatives from EA, will be involved in the production. Whether the series retells the events of the games or weaves its own unique yarn, Bad Company seems like a good candidate for a TV adaptation. Since its narrative strength is in its characters, any number of stories involving them should prove entertaining in the right hands. Videogames don't generally work as movies, but could they succeed in a serialized format?